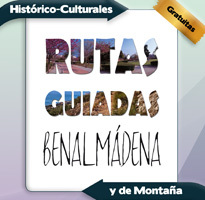 This route offers you the cultural and patrimonial wealth of Benalmadena due to the architectural singularity of the buildings that make up this route and the variety of contents that you can find within them. The proposed route crosses the three main parts of the town, and its starting point is located in the Benalmadena Exhibition Centre. It is best to go round the route in a vehicle, so that you will be able to access all the places of interest. It is also possible to go round it in public transport with the following bus lines: 15 / 112 / 121 / 126. TOTAL DISTANCE OF ROUTE: 9 km. This is the main municipal building dedicated to large cultural exhibitions of all artistic disciplines. It was planned and specifically designed to serve as a top-quality exhibition centre and it has allowed Benalmadena to be introduced within the national and international circuits of painting and sculpture. The building consists of 850 square meters of construction and 600 square metres of exhibition space. With its 4 storeys plus storage and office space, this centre is designed to allow independent access to a top floor that may be used for a classroom and catering services. The centre is also equipped with an air conditioning system to maintain a steady temperature of 18°- 20°C and fifty percent of relative humidity. The Centre's agenda provides a schedule of 6-8 exhibitions per year, including painting, sculpture, archaeology, historical patrimony, architecture and photography. This castle is an Arabic-style construction and it is decorated with tiles and bas-reliefs that follow the elegant Nasrid tradition. The surroundings of the building offer gardens that feature several Muslim inspired fountains, making this building particularly beautiful. The construction dates back to the beginning of the 20th century, 1927 to be exact, when the building first started off as a country villa for a well-off family at the time. Subsequently, the building has been changing owners until 1980, when Benalmadena Council decided to acquire it as a cultural building which is its present role as the host of exhibitions, concerts, conferences, civil weddings etc. This auditorium comprises a set of venues for outdoor performances in the surroundings of the 'Parque de la Paloma' (Paloma Park). This venue is a meeting place for cultural activities which are organized in the town, especially during the summer when all sorts of events take place every year. Town: Arroyo de la Miel (Benalmádena). This is considered as one of the best libraries in Spain due its location, as well as its services and facilities. Located next to the 'Parque de la Paloma' (Paloma Park), this library has some exceptional facilities and its modernity and spaciousness attract attention, as well as its large parking areas. With regard to its facilities, it consists of a general library; a child/ teen library; a library for foreigners; a newspaper and periodicals library, a multimedia library and internet and meeting rooms. This is one of Spain's most modern and best technically equipped libraries. Address: Camino del Prado, 6. This cultural centre located in 'Arroyo de la Miel' is a municipal building that houses local council offices, as well as municipal delegations. The 'Casa de Cultura' is a historical building that was originally used as the first school in 'Arroyo de la Miel'. Of distinct Andalusian style, this building houses an interesting courtyard in the interior of the building that is surrounded by different offices among which the 'Salón de Actos' (or Assembly Hall) is worth highlighting on the ground floor. Address: Plaza de Austria, s/n. Town: 'Arroyo de la Miel' (Benalmádena). The only one of its kind in Andalusia and home to one of the most important and existing collections of Pre-Columbian America in Spain with antiquities originating from Mexico, Peru, Nicaragua, Colombia and Ecuador. This museum includes pieces that belong to the private collection of Felipe Orlando, who was the director and curator of the museum since its inauguration, in addition to being the owner of the building, which was refurbished in 2005. You can also visit the archaeological remains that were discovered in the town, from the first settlers to the present day. This museum includes cave findings from the 'Cueva del Botijo', the 'Cueva de la Zorrera' and the 'Cueva del Toro'; this last cave could have been a sanctuary pertaining to the Superior Paleolithic era, situated in the area of Mount Calamorro. The most representative feature of this cave is the sketch of a headless bovid which is painted in red. Address: Av. Juan Luis Peralta, (no number). This monument is dedicated to Christopher Columbus and his arrival at the New World. It was built by Dr. Esteban Martín Martín and the help of two builders from the nearby town of 'Mijas', between 1987 and 1994. This monument was constructed in various architectural styles that were developed with brickwork, concrete, natural stone, wood and other materials, and you will notice its very beautiful stained-glass windows. For pre-arranged group visits, personalized talks and guided tours are offered in different languages around the monumental building at no extra charge, in addition to other activities. Address: Carretera del Sol (El Viñazo). The sports facilities make up one of the current attractions in Benalmadena. On this route, there is a brief description that explains what users can find on each one of them and the position of their whereabouts. The proposed route includes the three main parts of the town, and its starting point is located next to the 'Club de Hielo' (or ice rink). It is best to go round the route in a vehicle so that you will be able to access all places of interest or you can go round it using public transport if you like via the following bus lines: 15/112/121/126. The route can also be accessed on foot. One of the town's most emblematic sport facilities is definitely Benalmadena Ice Rink. Unique to Andalusia, this building provides a natural and permanent ice rink (except during the summer), and is especially designed for ice-skating. This sport complex was built in 2006 and is located in the centre of 'Arroyo de la Miel'. This council-owned sports installation was built in 2004 and is situated very near to the promenade of Benalmádena Costa. 'El Tomillar' is Benalmadena's oldest sports ground and belongs to the council. Built initially at the end of the 70's, it is located in the centre of 'Arroyo de la Miel', occupying a plot of around 10,000 m2. This sports ground has undergone different transformations over time. The pitch has 3rd generation synthetic grass of 50mm in height, which is weighed down with sand and granulated rubber, and it is also marked out for playing 11-a-side or 7-a-side football. This sports field is complemented with a stand and a spectator capacity of 1000. This sports ground was built in 2007 and is located next to the Benalmádena Pueblo road to 'Mijas' in an unbeatable location next to the largest Buddhist Stupa in Europe, and the 'Mariposario de Benalmádena' (Benalmadena Butterfly Park). This ground features a field of synthetic grass which is certified by the Federation of International Hockey for playing this sport at the highest level, and this is where the different teams of Benalmadena play and train. This facility is rounded off with 2 paddle tennis courts and a cafeteria. This municipal sports facility has more than 32,000 m2, which makes it the current largest sports centre in Benalmadena. Built in 1983, it was one of the most complete centres in the whole province of Malaga during that time. This sports complex was built at the beginning of the 90's where there used to be an old quarry at the entrance to Benalmádena Pueblo. Year after year, it has been establishing itself to be one of the most popular buildings these days among the people of the town. The leisure parks are one of the most important tourist attractions that Benalmadena has to offer. On this route, there is a brief description that explains what the user can find on each one of them and the position of their whereabouts. It is best to make a schedule of your visits and do them over the duration of several days if this is possible, so that you will be able to thoroughly enjoy everything that these centres can offer. The proposed route includes the three main parts of the town, and its starting point is located in Benalmádena Marina. and even the legendary sharks. You can also visit the Otter Oasis so that you can enjoy the Asian otters which are the smallest in size within their species and are able to reach 65 cm. In the main and large salt water swimming pool, fun shows are performed every day where the leading performers are the family of sea lions from the Patagonia and a family of dolphins which belong to the Mular or Bottlenose species that delight both adults and children with a programme especially designed for a public of all ages. The Ice Island is the large Penguinarium of the centre that is home to the most complete and important collection of penguins from European zoological centres. Educational programmes are also available. and the possibility of practising adventurous sports such as hiking around the perfectly sign posted paths that lead to different viewpoints. This is quite an experience of enjoying a fantastic day in a unique place. A whole world of fun to be shared with the family. There is a variety of exciting shows and attractions in the Western, Andalusia, Jungle, and Tivolilandia Squares, as well as the 'Barco Misterioso' (Mystery Boat). Special shows and unique events are also offered under the exclusive theme of terror. Among the theme bars and restaurants, there are numerous options for you to taste and satisfy your appetite while you enjoy the park's wonderful atmosphere. This novel nature park and all the colours that it can offer are here for your enjoyment. The 'Mariposario' offers more than 1,500 butterflies flying around in a tropical habitat which originate from all parts of the world, and it is possible to see more than 150 different species throughout the year. Built in a Thai style, this is a glazed tropical garden with an area of more than 900 m2 and eight metres in height. In this butterfly park, the plants also share the main attraction due to their beauty and their importance, considering that they are a necessity for them to live. The butterflies feed and reproduce on them. Each species of butterfly needs a particular plant to put their eggs on and the survival of their offspring depends on this. The environmental conditions of this butterfly park are ideal for our butterflies but they are also ideal for the other undesirable inhabitants of any garden - pests. We can't fight them using insecticides, not even with the biological ones because these would affect the butterflies, so this is why we fight back using the biological method that consists of using the pests' natural enemies, in order to keep them under control. One of our objectives is environmental education, which is why we use this example.